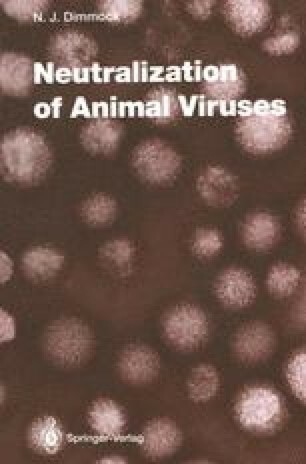 The binding of neutralizing antibody does not automatically mean that a neutralizable virus will lose infectivity. A virus can bind a certain number of molecules of antibody—a subneutralizing amount—which can either have no detectable effect on its infectivity, or permit it to infect cells by attaching to receptors for the antibody (or receptors for molecules of the complement system which have attached to the bound antibody) instead of the usual virus-specific receptor. The latter phenomenon, called antibodydependent enhancement (ADE) is a well known property of certain antisera but it is only recently, through the use of mabs, that it has it been possible to demonstrate unequivocally that the same immunoglobulin molecule can, depending on the circumstances, be both neutralizing and enhancing (Porterfield and Cardosa 1984).